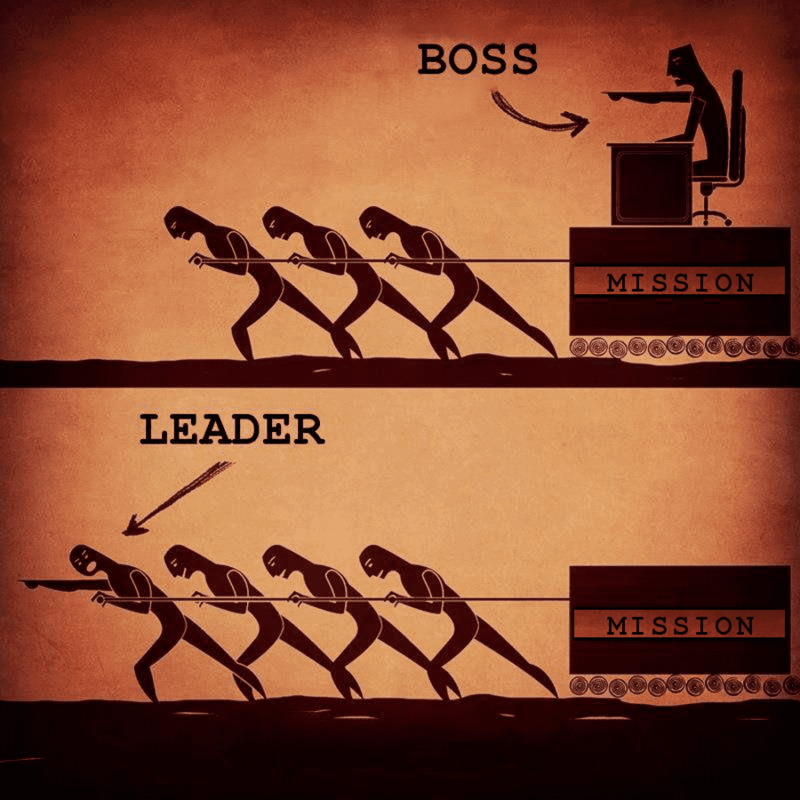 What’s the difference between a good leader vs. bad leader? What do the good leaders do differently? It’s an essential question every leader must ask themselves. Every leader faces challenges and situations every day that test their patience, skills, and mindset. There is no magical, drama-free team. What separates a good leader vs. bad leader is how they handle the challenges they face every day. Today, we take a look at 5 situations that are handled very differently by leaders depending on their good or bad approaches. Recently, we wrote a post looking at how a positive outlook can make a huge difference in your daily happiness and how you lead. Leaders told us they loved our good vs. bad storytelling approach, so we’re bringing it back to highlight the differences in a good leader vs. bad leader. The situation: An employee comes to you with a suggestion to help the team. As their leader it’s something you probably already should have done, but haven’t gotten around to. Bad Leader: While they may not have meant to, it feels annoying that they’re trying to tell me what to do. I’m either going to ignore what they said, come up with some excuses to not act on it, or find something to criticize them about. The Result: Your team member will learn making suggestions isn’t worth the effort. Much will go unsaid, good ideas will lay dormant, and your team is likely to complain about you behind your back. Good Leader: It’s never fun to face harsh truths, but you embrace it. You recognize that your team needs to feel comfortable bringing concerns and ideas to you, so you thank them for the feedback. You also ask a few questions to be sure you understand their suggestion fully. The Result: Your team member feels heard, and you gain new understanding why you may want to bump an issue or opportunity up your priority list. Feedback from your team is the lifeblood of good management; they see so much you don’t get the chance to given all your responsibilities. If you’ve made a few mistakes and need to work on your team being more comfortable giving you feedback, this post can help you get more feedback from them. Bad Leader: Shocked and offended, you think to yourself, “How dare they question my decision? ?” You glare at the team member, and change the subject to focus back on the original discussion. The Result: A chilling effect sweeps across your team. They know not to raise tough questions to you in meetings and just go along with things. Healthy debate is a phrase foreign to your team. Good Leader: You take a deep breath and address the question head on. Depending on the situation, you either explain the motivations for the decision they may not know for the benefit of the whole team, or you engage them socratically to allow questions to them to reveal the reasoning. If the way they asked was disruptive, you talk to them about it in their next 1 on 1 or privately after the meeting. The Result: Your team sees that with you, there are no dumb questions, and it’s safe to challenge the status quo. This helps your team explore new ideas fully, and avoid missing the forest for the trees. It can be hard to manage people who have strong opinions and ideas, but they can also be your greatest asset. If you remember you’re all on the same team and trying to win together, you can avoid feeling negative about their comments. Best of all, if you work on your skill at asking questions, you can engage them and your whole team to more deeply understand where they’re coming from and the best solution going forward. Learn more about the skill of curiosity and asking questions here. The situation: You have someone on your team in a role you’ve never done yourself. You’re not familiar with all the nuance of what they do, nor their keys to success. Bad Leader: You feel a bit threatened by the hire, and some imposter syndrome, so you fake it. You pretend you know more than you do and go super hands off with them. It’s their job to tell you what you need to know, right? The Result: Communication quickly breaks down between you and the team member. They roll their eyes when you pretend you know what they’re talking about. Your relationship becomes adversarial as they try to manage you out of the way so they can just get their work done. Good Leader: Recognizing your knowledge gap, you take it head on. You spend time with them to learn from them and ask questions when you don’t understand something. Together, you come up with a plan you can hold them accountable to for the work you’re less familiar with. The Result: You build more trust with them, and show that your team has a culture of humility for things they don’t know. By having a plan, you can still tell how they’re performing relative to expectations despite your relative newness to their field of work. As important as developing the task relevant maturity of your team is, your task relevant maturity matters, too. Embracing the need to learn new skills and admit when you don’t know is a growth mindset well worth demonstrating. Learn more how to level up your task relevant maturity here. Bad Leader: Resentful of their communication style, you blame them for all communication issues. After all, you’re the boss, so they should adapt to you. Using your preferred style, you drop subtle hints that they seem to be completely ignoring, much to your frustration. The Result: You both become increasingly frustrated with each other. You feel like they’re abrasive, and they feel like they can’t get a straight answer from you. It makes you both want to avoid the other, leading to poor teamwork. Good Leader: Recognizing their difference in personality, you make an effort to better understand them. You try to be more explicit in your communication with them, and not wince too much when they’re more direct than you’re used to. You also coach them on how to get a point across with slightly smoother edges. The Result: While it’s not easy, you work together to reach an understanding in how you each communicate. Finding some common ground leads to better results, and open communication keeps ideas flowing between you both. Any time there’s a problem on your team, it’s important to start by looking in the mirror. There’s always something you were doing (or not doing) to contribute to the issue. A healthy dose of self-awareness can help you start from a perspective of how you can do your part to improve difficult situations. Best of all, when you lead the way taking problems head on, you make it easier for your team members to admit faults and do their part as well. Learn how to improve your self awareness here. The situation: You get a coach to help you be a better leader. The coach tells you passionately you must do something you’ve never gotten around to. Bad Leader: You shrug off the advice thinking, “It’s extra work, and I’m sure it can wait. I don’t see them for a month anyways.” You let your mind run and rationalize away why the advice doesn’t apply or isn’t as important as the 38 other things on your to do list. The Result: You miss out on the impact your coach knew the effort could have. Compounding the issue, when they see you haven’t made the change, they start to lose faith in your willingness to listen. Soon, they’re less interested in coaching you, or avoid certain topics that could help but seem to fall on deaf ears. Good Leader: You recognize that you picked this coach for their experience and insights. If they’re passionate about doing this now, it must be important. It’s not easy making time, but you find ways to carve out enough to get it done. The Result: You complete the effort and you see how it starts to impact your team in ways you never expected. Your coach also becomes more confident in working with you seeing that it’s a good investment of their time. They continue to challenge and push you to become better because of it. There’s never enough hours in the day to do everything we want to do. That’s why it’s so important to manage your schedule well so you don’t fill it only with low value tasks. Whether you choose to eat the frog first thing in the morning, or use the pebbles, sand, and water analogy to budget your time, making sure to get important things done is critical to your success as a leader. Sometimes that can be especially hard because there’s so many fires. This post can help you get out of that reactive management mode if you’re in deep. The difference between a good leader vs. bad leader is often subtle. It’s all in your mindset and your ability to take ownership of problems and opportunities in a positive way. In all the situations above you can see how the same helpful people all around them can be met with either resistance or gratitude. The good leader sees the glass half full that everyone wants to help them. Meanwhile, the bad leader is stressed out and can’t figure out why everything is always so frustrating and trying to give them more work. It’s easy to read these and say, “I’ll be the good leader, of course.” However, it’s harder in the moment. You need to have a growth mindset, manage external pressure, and fight any imposter syndrome that has crept into your psyche. No one is a natural at all of this, so stay positive even when you slip. Teams respect leaders that admit when they’re wrong and put in the work to make things right. The payoff is well worth your investment: loyalty, hard work, and seeing the best work from your team. Want to build more accountability in your team and become a better listener? Then sign up for a free trial of Lighthouse. 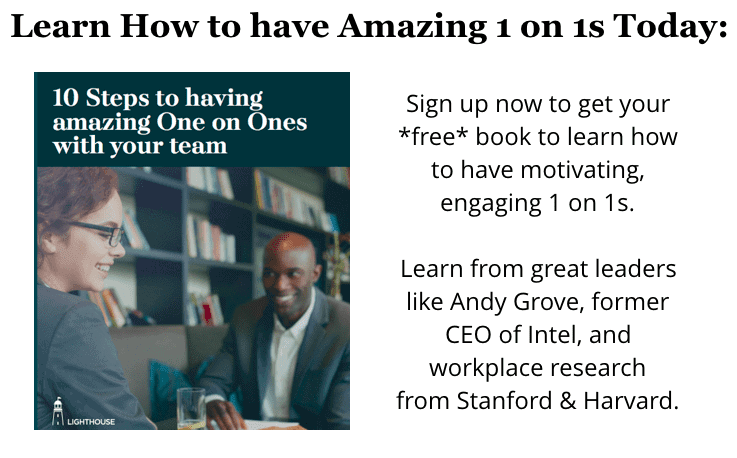 It’s purpose built to help managers like you. 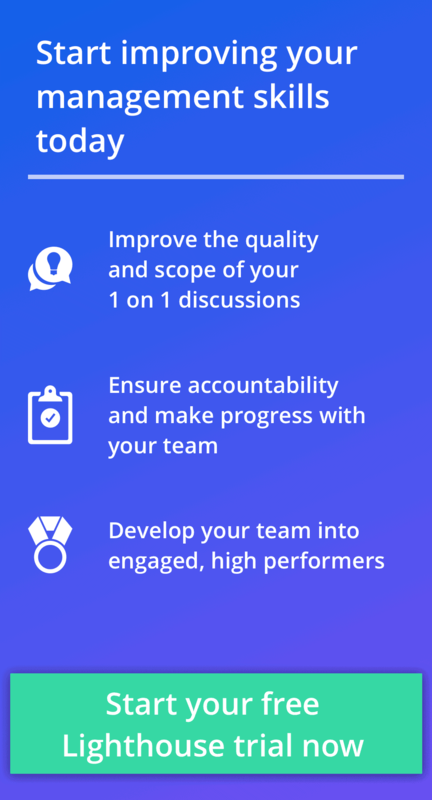 Improve your relationships with your team through better conversations and greater accountability. Start your free trial now here.